A pair of Chicago-based astronomers have some good news for you alien-hunters out there. Despite previous assumptions, geophysics tell us that large Earth-like exoplanets (a.k.a. super-Earths) likely have both oceans and exposed continents. That means more Earth-like climates, too. 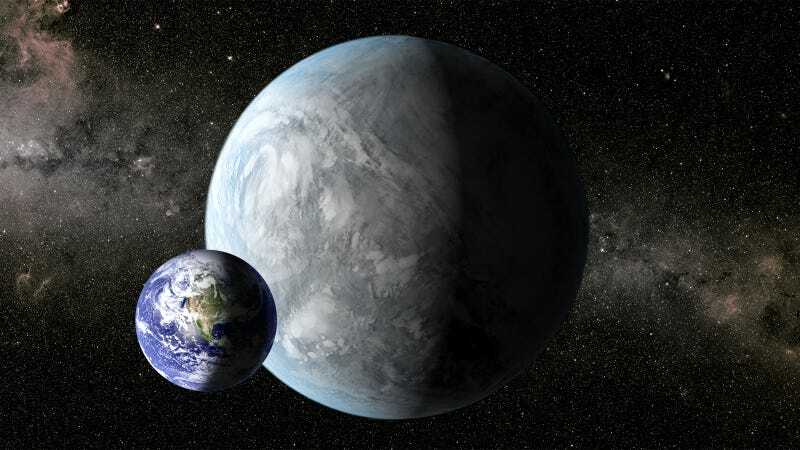 Northwestern's Nicolas B. Cowan and University of Chicago's Dorian Abbot just presented a new theoretical model for super-Earths, and their argument makes good sense. It also bats down the current assumption that super-Earths are all water worlds. "Super-Earths are expected to have deep oceans that will overflow their basins and inundate the entire surface, but we show this logic to be flawed," says Cowan. "Terrestrial planets have significant amounts of water in their interior. Super-Earths are likely to have shallow oceans to go along with their shallow ocean basins." The interior water he's talking about is water that's stored in the planet's mantle. The force of gravity and sea floor pressure would create a deep water cycle that pumps water into the mantle, keeping it from overflowing on the rocky surface regardless of how much water is on the planet. This bears big implications for the planet's climate. "By making super-Earths 80 times more likely to have exposed continents," Abbot said, "we've dramatically improved their odds of having Earth-like climate." In other words, those fantasy drawings of foreign planets with funny-shaped continents and big blue oceans probably aren't fantasy at all.